The best quality, value and service is more than a promise - it's a commitment. Once upon a time many years ago, back in the bad old days of 1929, a wizard by the name of Edwin Jordan-Knox saw future success in his crystal ball. He knew that if he chose magic carpets as his stock in trade, his family and all the people who worked with him would prosper. And, lo and behold, he was right! He chose a prestigious position on Granville Street in Vancouver, the first of more than two dozen retail locations to come, the foundation of the Jordan Empire . He could not have found a more exciting setting for his enterprise. Vancouver is Canada's gateway to the Pacific and the East and has many claims to fame. Some of the country's greatest adventurers converged here. Explorers seeking the Northwest Passage found their way past the natural barriers of the prairies and the Rocky Mountains and down the intricate network of rivers. The trans-Canada railway hammered along the same path. People from the Orient who arrived late in the 19th century helped to build the region, and the size of its Asian population grew to be the second l argest in North America. The Granville galleries were beautiful, designed to display the finest Oriental rugs Jordan-Knox could find on his travels. His sources were originally Persia and China and he soon added fine hand-knotted Indian rugs at moderate prices to expand clientele horizons. “Taj Mahal” and “Tajeran” rugs are registered trademark names and became an important part of Jordan's business. It was the beginning of inexorable growth and now rugs fly from weaving centres in Pakistan, Afghanistan, Tibet and Nepal as well. A hunger for wall-to-wall broadloom erupted just after World War II, and Jordans led the way, forming long lasting relationships with major mills overseas, in Canada and in the United States. Markets were expanding and the company entered the contract field. After the Vancouver launching, Jordans reached out to Calgary, Edmonton and Victoria, and into most of the company's other market areas to service both smaller commercial buildings and high-rise developers. 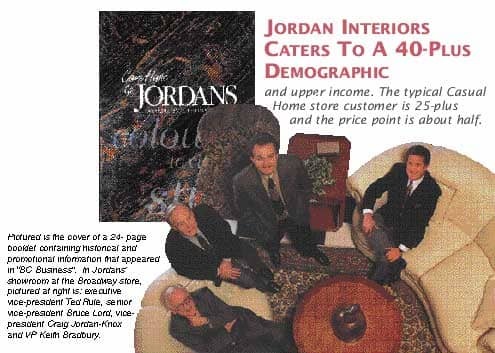 Jordans Interiors became a working entity in the late '50s, as the West prospered, to meet an increasing demand for fine furnishings. Office Furnishings, a contract division, soon filled another important need, the office market, as well as the institutional and hospitality industries. From their 11 offices in British Columbia and Alberta, the Contract and Commercial Division “covers everything” from high rise to hospitals, plus schools, hotels, office buildings and retail stores. And magic carpets are not their only stock in trade. Ted Rule, Executive Vice President, talked of their “experienced specialists” who supply and install carpets, certainly, but also “ceramic tiles, resilient flooring, laminates and hardwood”. In-house consultants advise when clients select “specialty floors that require special substrate and installation knowledge”. President David Jordan-Knox, grandson of the founder, said the company has “installed more floor covering in homes during the past 75 years than any other company in Canada”. And luxurious carpets and fine furnishings were combined very successfully along the way. We talked with genial Keith Bradbury, Vice President Jordans Interiors. He joined the company 34 years ago, “but that's not a record,” he said. “There are people who've been with Jordans for 50 years.” He'd worked for a furniture store in Saskatchewan for three years when Jordans opened across the road. His employer decided to close and Keith was offered a job by Jordans’ in Vancouver. He accepted and, as they say, the rest is history. More than 25 years ago, Jordans began computerizing their systems. Many software programmes have been customized in-house and are well integrated into the business. It assists administration and management and also contributes to the overall sales effort through space planning and product cataloging for the designers, and estimates programmes for the commercial sales people. Jordans’ vast and complex preferred customer lists are, of course, on computer. Jordans' colourful website (www.jordans.ca) is well worth examining. It's planned logically with easy to follow instruction paths. The site tracks home furnishings alternatives, “formal living”, “casual living” and “contemporary living” with attendant services that include interior design, furniture, lamps, fabrics, window coverings, reupholstery, artwork, bedding and all important delivery and installation. There's an interesting site called “What's Hot” that features special items customers “must see” at the stores. Also listed is an impressive range of suppliers, amongst them Gibbard (one of the recent “What's Hot” stars), Barrymore, Leda, Waterford, Drexel Heritage, Baker, Charleston Forge and Marshall Mattresses. Keith is justly proud of his design staff. “Our designers work in teams, are fully qualified and their services are used a great deal, even for drapery and wall coverings, one-stop-shopping! We don't get into structural changes but do sometimes recommend them. We like to work from floor plans. David Jordan-Knox is convinced that the company's “strong reputation for integrity, service and quality” has been and is “the cornerstone” of Jordans and the principle reason for steady growth. We asked about events. “Not recently, but we're talking about it. Certainly we will mount an occasion in January to introduce our new line.” That “new line” is the exclusive licensed collection from Theodore Alexander, “Althorp, Living History”. The collection consists of 250 reproductions, both casegoods and upholstery, of Althorp furnishings. Every piece bears the Althorp seal and is either a replica, or was inspired by items from the estate. Althorp has been the Spencer’s family home since 1508. Keith met the 9th Earl and Countess Spencer at the October High Point Market and they arrived at an agreement to carry several pieces of the line, including “a very beautiful king-sized canopy bed”. 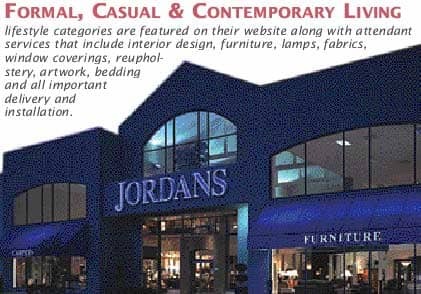 Jordans will carry Althorp in their stores beginning in April 2005. Jordans stores can be found all around Western Canada from the greater Vancouver area, Broadway, Park Royal, Coquitlam, Surrey and Richmond, across the Straits to Victoria on Vancouver Island, throughout the province in Nanaimo, Langley, Kamloops and Kelowna. In Alberta, Jordans is established at Calgary, Edmonton and Red Deer. May all their magic carpets continue to fly!